Palma, 24 January 2018: the temperature in the city was 19°. It is sunny, there is a cool breeze and the mid-winter warmth is a luxury in itself; yet Palma has so much more to offer. Keep reading to discover the endless simple pleasures waiting for you all year round in the capital of the Balearic Islands. Food, sport, art galleries, walks, beaches, shopping, culture and, of course, nightlife: this is Palma! In summer, the city is vibrant like no other, but for many the hustle and bustle can become too much. Some say Palma has a season to suit everyone. And each one, spring, summer, autumn and winter, is experienced entirely differently. This means visitors can choose how they want to experience and explore Palma. Autumn begins with one of the most cultural and glamorous events held in the city: the Nit de l’Art.In the evening of the third Saturday of September, all the art galleries in Palma spruce themselves up, open their doors to the public and put on an exhibition. The locals pour out onto the streets to enjoy a stroll and take advantage of the fact that all the museums and art galleries in the city are open. The weather is usually magnificent in autumn. It is no longer hot, but not yet cold. The sea starts to cool down as it is no longer as warm as it was in the summer and swimming in the water is very pleasant. The autumn light is very crisp and although the days are shorter, the intensity of the colours when it’s sunny is beautiful. Autumn is a great time for excursions and visiting beaches, which are no longer brimming with people as they are in the summer. In fact, they are often almost deserted in this season. 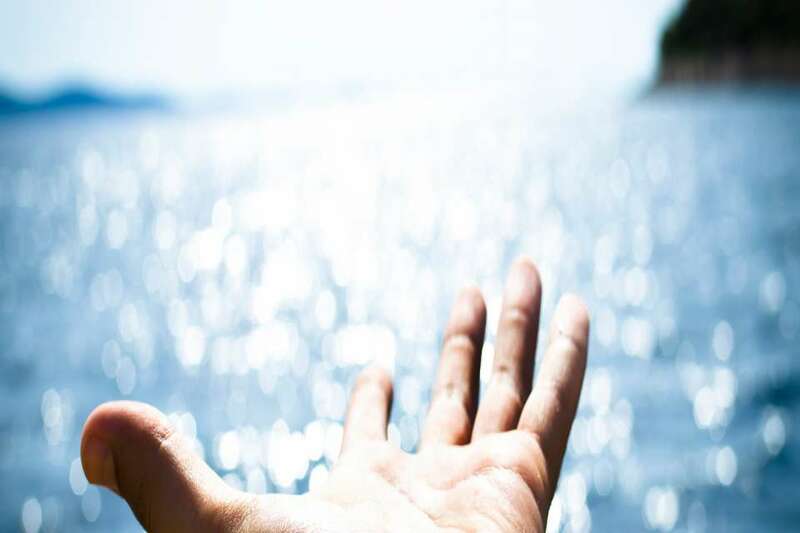 That's why it's a good idea to visit the Salinas d’Es Trenc salt mine and then go for a walk and even a swim in Es Trenc beach, the longest and most popular beach in Mallorca, renowned for its fine sands and blue waters. A good way to end the day is eating in the restaurant Cassai in Ses Salines, an amazing small village in the south of the island, an ideal place to discover the day-to-day life in the most authentic Mallorca. Runnersalso have an important date in autumn in Mallorca. That's because the Palma marathon takes place in mid-October. It is a must-attend event for fans of this sport. The city turns out to spur on the runners. Autumn is a great time to run and also to play golf: Son Muntaner, Aucanada, Santa Ponsa, Maioris, Pula, Son Vida and Son Gual are some of the most famous golf courses on the island. Another very different autumn phenomenon happens in Mallorca Cathedral every 11 November. If it is a sunny day, the sunlight reflects the building’s eastern rose window just below the rose window in the western part of the Cathedral, thus forming a colourful eight figure. Everyone that has seen this sight has marvelled at this magical moment for the few minutes it lasts. Many tourists come to the island just to see it and to feel the energy the Cathedral conveys at a time that is totally different to the busy summer. In autumn, Palma is a peaceful city perfect for strolling through the old quarter or immersing yourself in the contemporary art of the Es Baluard museum. As its Mallorcan name suggests, it is located on Sant Pere Bastion, which, together with Es Príncep Bastion, is one of the few preserved in the city majestically overlooking the sea. Autumn invites you to go shopping, sip a hot chocolate with an ensaimada(pastry) in Can Joan de s’Aigo, the oldest and most emblematic chocolate shop in the city; go out for dinner in the Santa Catalina district, famous for its numerous drinks and tapas bars and restaurants serving international cuisine like Sumaq, specialising in Peruvian food, or Patrón Lunares, serving Mediterranean dishes. Christmas starts off the Palma winter. The New Year is celebrated on the streets. At midnight, the locals eat 12 grapes, one for each ring of the bells, in Paseo del Born, where they are entertained by live music and see in the New Year dancing till dawn. Christmas is followed by the festivals of Sant Antoni, celebrated in many towns in Mallorca, and Sant Sebastià, the patron saint of Palma. These are very popular and traditional festivals and people line the streets to see correfocsde dimonis(devils with fireworks) and to roast sobrassadas(pork sausages) and botifarrons(blood sausages) over spectacular foguerons(bonfires). Although January is a cold month, it is usually sunny and the sea is often still and flat, like a mirror, known as the famous “January calms”, when sailing is a true delight. Winter is also the best season for cycle tourism. Just like cyclists, hikers usually adore walking in the mountains of the famous Serra de Tramuntana in this season and enjoying the spectacular views afforded by its most popular peaks: Es Tomir, Puig Major, Galatzó and Massanella. Route GR 221 goes through Serra de Tramuntana from North to South and it is a reference point for many excursions on the island as it is a real hiking paradise. After a long walk you can get your strength back by eating in one of the Tramuntana village restaurants, for example Miceli in Selva, or Ca Na Toneta in Caimari; or you could have a hot chocolate with a coca de patata (potato pastry) from the Can Molinas bakery in Valldemossa. If you want to go on a culinary route, it is worthwhile visiting DayCa restaurant in Llubí or trying typical Mallorcan dishes in one of the popular and famous cellersin Inca, in the centre of the island, such as Can Marrón, Can Amer and Can Ripoll. A wonderful winter spectacle in Mallorca is the blooming of the almond trees. 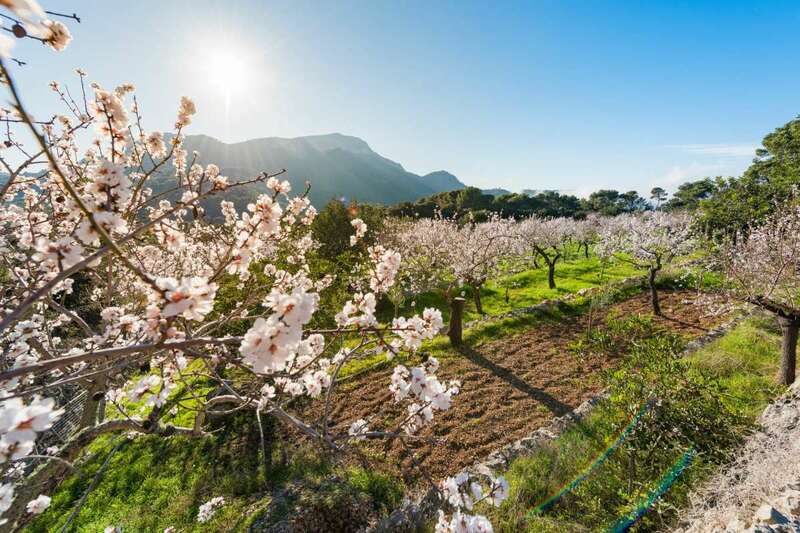 Seeing field upon field of these trees laden with pink and white flowers is such a spectacular site that trips are specifically organised to enjoy the beauty of the Mallorcan countryside when the almond trees are in bloom. Another spectacle that occurs in autumn and is repeated in winter on 2 February is the reflection of the rose window in the Mallorcan Cathedral under the rose window on the opposite side. Enjoy the wonderful site which can be seen from the cathedral terraces affording stunning views of Palma and its bay under the clear bright blue sky typical of winter. For many, spring is the best season to visit Palma. There are gradually more hours of daylight, the temperatures rise and the atmosphere in the city also heats up. The countryside, luxuriant and in flower with a myriad of green tones, is stunning. It is the best season for visiting or organising tours of the many wineries on the island. For example: Angel in Santa María; Galmés i Ribot in Santa Margalida; Castell Miquel in Alaró; and José Luis Ferrer in Binissalem. Binissalem is very close to another place worth visiting, the hamletof Biniagual. Markedly Mallorcan in character, nearly all of it was bought and renovated by a German entrepreneur in love with the island. If you prefer to drink beer rather than wine, Mallorca is also a good destination. The island has got involved in the boomingcraft beer sector. A good place to try one is the courtyard of the Beer Lovers microbrewery in Alcudia, which opens every Friday afternoon. If you visit Alcudia, you should also go to Sa Bassa Blanca Museum or the foundation of the artists Yannick and Ben Jakober, and walk to the watchtower from Victoria viewpoint, which affords a marvellous view of the bays of Alcudia and Pollença. There are excellent options for lunch and dinner in the area: Miramar restaurant in the Port of Alcudia; La Terraza in Aucanada; and Jardín, run by the famous Michelin-starred chef Macarena de Castro. Spring is a good time to wander around without the stress of crowds and to go on day trips. If you plan to go for a walk and enjoy sea views at the end, a good place to visit is Artá and Serra de Llevant, where you'll find one of the loveliest beaches on the island, called Aubarca. You could also go to Cala Mesquida beach, which is very close to another Michelin-starred restaurant run by the popular and charismatic chef Andreu Genestra. Genestra is also responsible for another restaurant in the centre of Palma, Aromata, which is housed in an old listed town building. Here you can try high-end Mallorcan dishes. Casa Maruka and Tast Club are also good dining options in the city centre. One of Palma’s major culinary events is held in spring. In April, Art Brunchcombines art and food. As with Nit de l’Art, the art galleries open their doors to the public, but this time in the morning at the weekend. On Saturdays in the morning many bars in the centre of Palma usually serve vermouth. Sipping it in the spring sunlight is an absolute delight. If instead of a vermouth you'd rather have a cocktail or another drink, the terraces of Nicolás or Gibson in Mercat square are a good place to go. This season brings the heat, the crowds and lots of things to do. It's Mallorca at its finest. And time to enjoy the sea. Hiring a boat is probably your best option. That way you can easily visit the most hidden away coves and beaches and avoid the overland traffic trying to get to coastal areas. You can hire all kinds of sailing or motor boats with or without a captain for weeks or days. The choices are endless. Palma Bay is naturally one of the best known, but there are many other options for sailing as you please. You can go around the island or cross the impressive northern coast from Andratx to Pollença by boat and stop off in the picturesque Port of Sóller. If you don't fancy getting on a boat, there are numerous other ways of enjoying the sea: diving, fishing, windsurfing, kitesurfing, stand up paddle, etc. And if stress-free sunbathing is what helps you relax, you need one of our beach clubs. The best known are Beach Club in Magalluf, Puro Beach Club, Mhares Sea Club and Balneario Illetas. Summer is also the time to get out of the house and enjoy having lunch or dinner outside. We suggest the terrace of the well-known Palma Yacht Club restaurant, or if you prefer a more rural setting, Molico in Sencelles. If you're seeking glamour and a select, sophisticated ambience, then the best destination is Portals harbour: the jet sethub and the most exclusive summer evening on the island. Great places to have lunch or dinner in Portals are Tahini and Flanigan. The latter is one of the Spanish royal family’s favourite restaurants when they holiday on the island. Autumn, winter, spring or summer Palma can offer you a range of enjoyable activities that depend on the time of year you visit. The city is perfect for all kinds of people and their differing tastes; all you have to do is make up your mind and choose the season that’s best for you. Hope to see you soon!